Artboard 1.4 is a vector drawing app for novices, and to that end, it does a good job of demystifying the often confusing concept of illustration to new users. It also handles certain tasks with a such finesse that pros will likely also be interested in checking it out. The app sports a minimalist layout, customizable toolbar, and a simple way to edit anchor points. This is in stark contrast to Adobe Illustrator’s convention that calls for a different tool for every function. There are additional contrasts with Illustrator that make Artboard an ideal tool for new users. One of the first things you notice is that the interface is silky smooth, making it a joy to lay down vector lines. The Pen tool lets you draw freely; and as you do, the vector line trails the cursor like a slippery snake. This smoothness is found throughout the interface, whether you’re moving objects around or modifying gradients. Happily, the app's speed and responsiveness is often complemented by smart techniques for interacting with objects. For example, rotation is handled deftly by two control points. Once you’ve created an object, clicking it reveals a crosshair and rotation handle. The crosshair can be repositioned anywhere within the object, and when you click and drag the rotation, the object will rotate around the location of the crosshair. Illustrator can do something similar, but it requires you to click the object to select it, choose the rotation tool, reposition the crosshair—and without an obvious handle—drag the object to rotate it. Artboard also shows you the exact angle as you rotate, whereas Illustrator does not. This methodology is carried over into tools such as Wedge and Polygon, where additional control points allow you to adjust an object's shape. The Polygon tool is particularly slick. 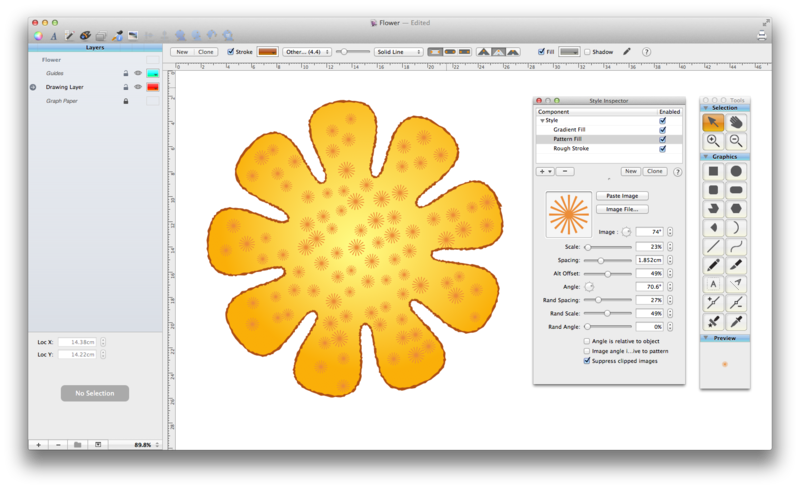 You can control the size and shape of both the valleys and tips, which allows you to create rounded stars, flowers and even cogs—something you won’t find in Illustrator. Artboard places a central focus on cascading styles, which can be confusing at first. Unlike other apps, Artboard automatically assigns every object a style, which is defined by its stroke and fill. Create three objects in a row, and they will have the same ad-hoc style; adjust the style on the last object, and it will cascade across all three. You can break the style link between successive objects by clicking New or Clone. The Style Inspector allows you to fine-tune any style and save it to a collection, and it’s here that you’ll find advanced stroke and fill options. These stroke options are beneficial, and why in some key ways they outclass Illustrator’s stroke and fill options. In addition to the basic stroke, you can use arrowed, tagged, roughened, and tapered strokes, each which can be refined. Fill options include solid, gradient, patterned, and hatched, and as with stroke, each fill type can be tailored to your liking. A single style can have multiple fills and strokes, too, so it’s possible to create an object with a slick tapered stroke, hatched fill that uses roughened lines, and a gradient to fill it out. Artboard lets you create custom polygon shapes with ease. Unfortunately, Artboard has some significant quirks and the app don’t always behave as you expect. For example, when laying down a vector path, you often click from point to point, placing perhaps dozens of anchors before you’re done. If you make an error as you place an anchor, it’s natural to want to undo. Unfortunately, with Artboard, Undo removes the entire line you’ve just laid down, rather than just the last anchor. It’s also unnecessarily difficult to choose the correct document size for your printer. The template chooser offers blank documents with long, truncated names such as “Blank (ANSI A)…per - Landscape” instead of presenting options like Letter, Legal and A4. The templates are usually sized, too, with the Letter (ANSI A) template listed at 7.7 x 10.5 inches rather than the standard 8.5 x 11. The developer explains that they’re listed this way to reflect the estimated print area, but it seems like a misguided effort given that printable area varies from printer to printer, and most printers these days allow borderless printing. The Drawing Size & Units menu lets you set the exact dimensions of your canvas in inches, centimeters, or pixels, which is helpful. However, even if you enter the exact paper size and then click the option to Subtract Paper Margins (an action the developer says is based on the margins of the currently selected printer), the document size might still be incorrect and you will end up printing multiple pages instead of just one. Choosing a standard paper size should not be this complicated. Artboard allows you to export your work as JPG, PNG, TIFF, and PDF, the latter of which can be opened in Adobe Illustrator. Unfortunately, Artboard cannot open vector files in other formats (including PDF). Artboard 1.4 is a very promising creative app that is bogged down by various quirks. Advanced users might want to wait for the app’s next major release before climbing aboard, but it’s a great starting point for novices looking to try their hand at vector illustration.